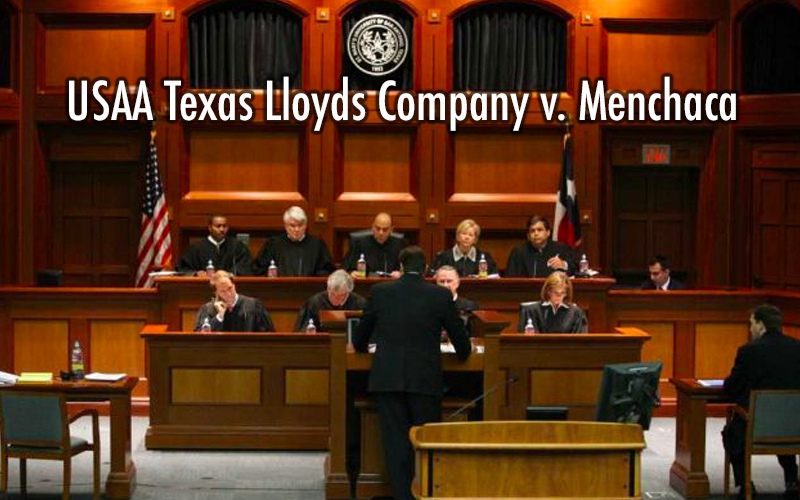 The Supreme Court of Texas heard oral arguments in USAA Texas Lloyds Company v. Menchaca in October. Menchaca is not a big money, multi-million dollar case (the jury awarded $11,350 for USAA’s unfair settlement practices, plus $130,000 in attorney’s fees), but it is one that has the potential to have a big impact on policyholders’ ability to enforce their rights in court. One issue before the court is whether the “independent injury” rule is, or should be, a part of Texas law. For some time, the insurance industry has been arguing that a rule extrapolated from the Supreme Court of Texas’s decision in Provident American Insurance Co. v. Castañeda, 988 S.W.2d 189 (Tex. 1998), holds that an insured cannot recover policy benefits for a violation of the unfair settlement practices provisions of the Texas Insurance Code. According to proponents of the rule, when an insurer fails to pay what is due under the policy, the policy benefits owned can only be recovered in a breach of contract claim, and the remedy under the Insurance Code is limited to harm caused by the insurer’s deceptive or unfair settlement practices over and above the amount due under the policy. This interpretation of Castañeda conflicts with the court’s earlier holdings in cases like Vail v. Texas Farm Bureau Mutual Insurance Co., 754 S.W.2d 129 (Tex. 1988), where the court held that held that damages for an insurer’s wrongful refusal to pay are at least equal to the policy benefits. Some courts have bought into the “independent injury” rule, particularly federal courts applying Texas law. This came to a head in the Deepwater Horizon case where Cameron International Corporation sued its insurer under the Texas Insurance Code for wrongfully withholding benefits. The district court followed Fifth Circuit precedent and granted summary judgment in favor on the insurer because the only damages Cameron was claiming for the Insurance Code violation was the amount due under the insurance policy, plus its attorney’s fees. Faced with its prior precedent embracing the insurer’s view of Castañeda and intervening decisions from intermediate Texas appellate courts reaching the opposite conclusion, the Fifth Circuit, certified the question to the Supreme Court of Texas. The Texas court accepted the certified question, but before it could rule, the case settled and the appeal was dismissed, leaving the issue unresolved. But what does all this mean for policyholders? Insurance companies owe duties of good faith and fair dealing to their insureds under both the common law and the Insurance Code. But when insurance companies don’t deal fairly with their insureds–when the fail to conduct a reasonable investigation of the claim; when they refuse to pay what’s owed under the policy, or engage in other conduct inconsistent with their legal duties—what is the insured to do? The insurance company is typically a multi-billion dollar businesses that are involved in litigation of something or other every single day. The policyholder, on the other hand, has property that needs to be repaired and not enough money to do it, absent the insurance. It’s David going up against Goliath, but through the Insurance Code, the legislature has given David a few stones for his sling. One of those stones is the availability of up to treble damages when the insurance company knowingly engages in certain unfair or deceptive acts. The additional damages are not automatic, even when the jury finds a knowing violation, and the amount is left to the jury’s discretion, subject to the limit of “three times the amount of actual damages.” (In 2011, the Texas Windstorm Insurance Association was exempted from this provision.) There was no “knowing” finding in Menchaca, but if the court were to adopt the “independent injury” rule that USAA and its amici are arguing for, in most cases there would be no penalty for knowing violations because there would be no “actual damages” to treble. In the last legislative session, there was a bill that would have redefined “actual damages” under this provision of the Insurance Code to exclude policy benefits wrongfully withheld. The legislature refused. USAA and its various amici are now asking the courts to do what the legislature would not. But the potential ill effects of the “independent injury” rule go much farther than that. The next step for insurers would be to take away the insured’s right to recover her attorney’s fees when she has to hire a lawyer to make the insurance company pay what was due under the policy. The general attorney’s fee statute, § 38.001(8) of the Texas Civil Practice and Remedies Code allows recovery of attorney’s fees “from an individual or corporation” for breach of contract claims. There have been a number of cases from the Supreme Court of Texas and intermediate Texas appellate courts affirming attorney’s fee awards against entities that are neither individuals nor corporations (for instance, partnerships, limited partnerships, and limited liability companies), but these cases do not address the recoverability of statutory attorney’s fees from the defendant under the “individual or corporation” language because the issue was not raised on appeal. However, there have been cases where entities like a partnership or limited partnership successfully argued that they cannot be liable for attorney’s fees under the statute because they are neither individuals nor corporations. Some insurance companies that are not organized as corporations (Lloyds companies, for instance) argue that they cannot be liable for attorney’s fees on a breach of contract claim because they are not corporations. The reported cases do not show this being an issue on appeal in insurance cases, perhaps because juries that find a breach of contract typically also find an Insurance Code violation. While the jury can find the same damages for a breach of contract claim and for the Insurance Code violation, the plaintiff cannot recover the same damages twice, and plaintiffs typically elect to recover under the Insurance Code, which has its own attorney’s fee provision, so whether the plaintiff could have recovered fees under the general statute becomes a non-issue. However, if the court were to adopt the “independent injury” rule, every insurer that is not organized as a corporation will be arguing that they cannot be liable for attorney’s fees at all, except in those unusual cases where the plaintiff can show the insurer’s unfair settlement practices caused an injury beyond the failure to pay what was due under the policy. And if the courts were to accept that argument, it would effectively leave ordinary policyholders with no recourse when an insurer (other than ia insurer organized as a corporation) wrongfully denies a claim because the cost more to hire a lawyer would in most cases exceed any possible recovery. The issues in Menchaca are sufficiently serious that Cameron, a Schlumberger Company, felt the need to submit an amicus brief even after its case had settled showing not only the pernicious effects of the federal court’s application of the “independent injury” rule in the Deepwater Horizon case, but also demonstrating that the issues in Menchaca are not just a matter of concern to homeowners with hail-damaged roofs, but also across a whole spectrum of individuals and businesses that buy insurance with the expectation that the insurer will act in good faith when it comes time to deal with a claim. The Texas Automobile Dealers Association, Brass Real Estate Funds, Texas Independent Automobile Dealers Association, and Texas Organization of Rural & Community Hospitals also submitted an amicus brief further demonstrating the significance of Menchaca is not limited to homeowner’s insurance policy holders. United Policyholders (a national non-profit advocating for the interests of policyholders) also submitted an amicus brief arguing against an “independent injury” rule because it is not required by previous Supreme Court of Texas authority, because the legislature has not imposed such a requirement, and because it is just bad policy. On the other side, insurance industry and “tort reform” groups including The Insurance Council of Texas, the Chamber of Commerce of the United States, and Texans for Lawsuit Reform, lined up behind USAA. The principal issues are (1) whether an insured must prove an injury independent from denied policy benefits for a deceptive-or-unfair-practices claim under Insurance Code chapter 541 or, if not, (2) whether a finding the insurance contract was not breached precludes the insured from separately recovering policy benefits under the Insurance Code. In this case Menchaca sued for policy breach and unfair practices after USAA determined her homeowner’s policy covered Hurricane Ike damages to her home, but that her total damage fell below her deductible. The jury heard contrasting experts on damage attributed to the storm and found USAA did not breach the policy but did violate the Insurance Code by not reasonably investigating her claim. Jurors awarded Menchaca $11,350 for actual damages on her unfair-practices claim and $130,000 for attorney fees. USAA moved for postjudgment verdict in its favor, arguing the jury’s finding that the policy was not breached precluded bad-faith or extra-contractual liability. The trial court denied USAA’s motion. The court of appeals affirmed the trial court’s judgment for Menchaca. Question No. 1 of the jury charge asked whether USAA “fail[ed] to comply with the terms of the insurance policy with respect to the claim for damages filed by Gail Menchaca resulting from Hurricane Ike.” In its responses to Questions Nos. 2 and 3, the jury found that USAA refused to pay the claim without conducting a reasonable investigation and that, as a result of USAA’s failure to comply with its duty to investigate, it underpaid her claim by $11,350. USAA’s argued that there can be no Insurance Code violation without a breach of contract, and the jury’s “no” answer on the contract question precluded liability on any extra-contractual claim. USAA further argued that under Castañeda, failure to investigate is not a basis for recovery of policy benefits, and because there was no “independent injury,” there was no basis for recovery under the Insurance Code. With respect to the “no” answer on the contract question, Menchaca’s argument was twofold. First, from a procedural standpoint, Menchaca argued that under Supreme Court of Texas precedent, the jury’s failure to find a breach is not the same as an affirmative finding that USAA complied with all its obligations under the policy. The breach of contract and the Insurance Code violation are independent claims, and Menchaca proved and secured findings on every fact necessary to recover for the Insurance Code violation, and that is all that matters. Second, from a factual standpoint, USAA’s corporate representatives told the jury that there was no policy provision requiring USAA to conduct a reasonable investigation (or any investigation at all, for that matter), and that USAA paid for all the damage it found, which was all the contract required. (This is literally true in that there is no provision in the insurance policy requiring USAA to investigate; that is a duty imposed by the Insurance Code.) If USAA had found additional damages, it would have paid for them, but it did not find them, so it was not required to pay them. The jury appears to have accepted this line of reasoning, which explains why it did not find a breach, but it did find that there were amounts owed under the policy that it would have found and paid if it had complied with its statutory duty to conduct a reasonable investigation. With respect to the “independent injury” rule, Menchaca argued that the rule is extrapolated from a misreading of Castañeda and is inconsistent with other supreme court authority, the rule is not found anywhere in the statute, the legislature refused to write it into the statute in the last session, and it is just bad policy. While the viability of the “independent injury” rule may be the big issue in Menchaca, it is not the only issue, and it is one that the court might not even reach. If the court were to accept USAA’s position that the “no” answer on the breach of contract question is dispositive of all claims, it could decide the case without ever getting to the issue that has drawn the attention of so many amici. Still, for anyone interested in insurance policyholder’s rights, this is one to watch. Oral argument in USAA Texas Lloyds Company v. Menchaca, Case No. 14-0721, was held in the Supreme Court of Texas on October 11, 2016. The briefs and arguments are available on the court’s website at: http://www.search.txcourts.gov/Case.aspx?cn=14-0721&coa=cossup.